With an evergreen weight-loss industry constantly putting the blame on their customers, it comes as no surprise that guilt about eating, let alone overeating relentlessly tortures dieters’ or “wannabe dieters’” minds. What I mean by wannabe dieters are people who are dissatisfied with their weight and who may consider dieting as a possible solution. This includes any form of food or calorie restriction, temporary fasting, forbidden food lists and so forth. I know someone whose food guilt makes her exercise for an hour for every cookie she eats; I know others who binge eat only to have massive feelings of guilt and shame just after eating, and yet others who just feel guilty about everything and for whom food is just one small aspect of their guilty feelings. I used to feel guilty just for existing. I was the “I’m bad to the core; it’s all my fault” person. Not any more! 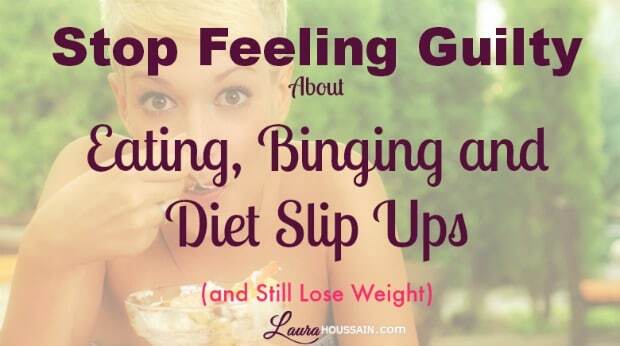 That’s why I’m really excited to share with you below my best tips to help you stop feeling guilty when you eat. I know several people who just feel guilty about eating anything. Even the slightest amount of food. They feel as if hunger is an abnormal feeling. I’ve met others who just won’t tolerate eating any foods belonging to the “bad food list”. Usually they have memorized food lists to perfection and are following very precise rules, usually dictated by one or several food gurus. They are trying really hard to work on maintaining a healthy or perfect diet. In both cases, eating can feel scary or unnatural. The need for food feels like a threat and food itself feels like the enemy. It’s as if eating presented a huge risk of getting fat or having something horrible happen. This may make eating a very unpleasant experience. If you are concerned that eating will make you fat and your concern has reached such proportions that you feel bad about eating any food, I invite you to consider the long-term outcome of food restriction. If you restrain your diet too much, you will teach your body to hold on to calories to prepare for days of famine. Also it will cause irrepressible cravings triggering you to eat as much as possible. 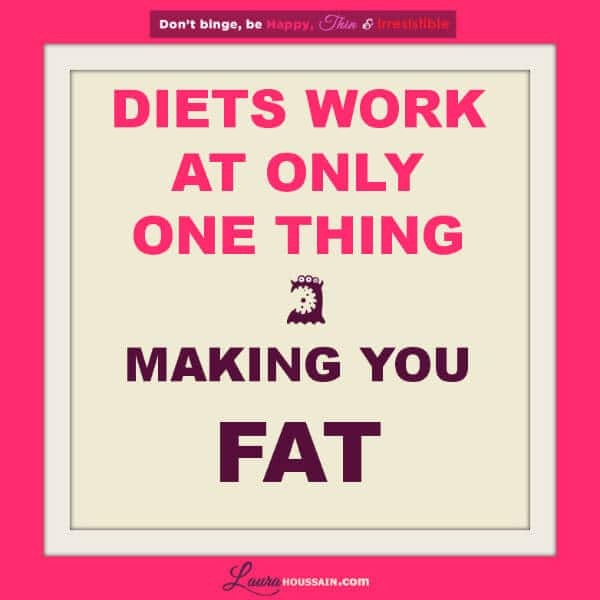 In other words, dieting makes you fat. Constantly watching over everything you eat, actually promotes almost inevitable weight gain in the long term. I’ve recently read a book by a writer who spent time interviewing thin people. He made sure they were truly at peace with food. Their eating habits match my own to a tee. For example, they eat when they are hungry and have no forbidden foods. They just eat them moderately and never feel guilty. It’s no coincidence. So if you feel guilty about eating because you are convinced that dieting is the only way to reach or keep at your ideal weight, you can let go of this fear forever right now. Stop blaming yourself for “falling off the wagon” or having “cheat days” on a diet program that is just not possible to follow long-term. I know that I’m facing a very powerful industry, selling you things like: “Don’t eat this.” , “Eat that or else.” and “Eat my way or the fat way”, endorsing just the opposite of what I’m saying. I’m really quite angry that such an industry would play with your mind, keeping you feeling guilty, scared of food, wasting vast amounts of dollars, time and sweat just to get unsustainable results and food cravings. If you’ve tried dieting for long enough, you may be sensing that something is broken, and that something may not be you. Well, you’re right. What is broken is the promises this industry has made you. It just doesn’t work that way. The truth is your body is much more perfect that they want you to know. If you learn to trust body’s natural signs, you won’t need another diet plan ever again. Finally, it has been scientifically proven that people who enjoy the food they eat, tend to gain less weight from their food than people who eat the same amount of food with a feeling of guilt. So next time you feel guilty about eating, I would like you to consider all the pleasure you have been missing by putting so much pressure on yourself. If you are an emotional eater, you first to need learn how to handle your emotions without food. Once you have, you will be able to listen to your body’s hunger cues and eat normally without the risk of putting on weight. Sometimes, someone will say “Eating makes me feel guilty but I don’t know why”. If one of your parents or caretakers, siblings or peers told you that you it was wrong to eat certain things, or to be overweight, you may suffer from shame on top of guilt when it comes to food. In that case, you may have internalized a feeling of shame and rejection, putting even more pressure on yourself to diet and rejecting food entirely. In this case, your best solution is to acknowledge that their fear of your weight or your eating patterns was their problem and not your business. This will free yourself from any need to please them, being a nice girl or boy and abiding by old rules. If it was your parents, maybe your behavior made them feel inadequate, guilty or that they were bad parents. It really had nothing much to do with who you were. Now is the time to free yourself. You can do so by comparing your internal dialogue to what they told you, and make new decisions about yourself. It may seem like nonsense to you, but accepting where you are now is the only way to change it. As long as you’re busy resisting it, you’re actually keeping yourself stuck in the same old situation. The secret is to observe, acknowledge and welcome your internal dialogue as if it is not your own, and deliberately make different choices. Guilt will subside once you decide to listen to your internal dialogue without acting on it or giving it any power. Your mind is just serving you up old stuff it has learned and still believes to be true. That doesn’t mean that it really is true. This may take a little practice, but it’s incredibly efficient. As I mentioned above, diets don’t work long-term. According to studies, only 2% to 5% of dieters keep weight off long-term. For example, if you consider that 2% of the US population are binge eaters, this increases a teenager’s chances of to developing an eating disorder to 36%. 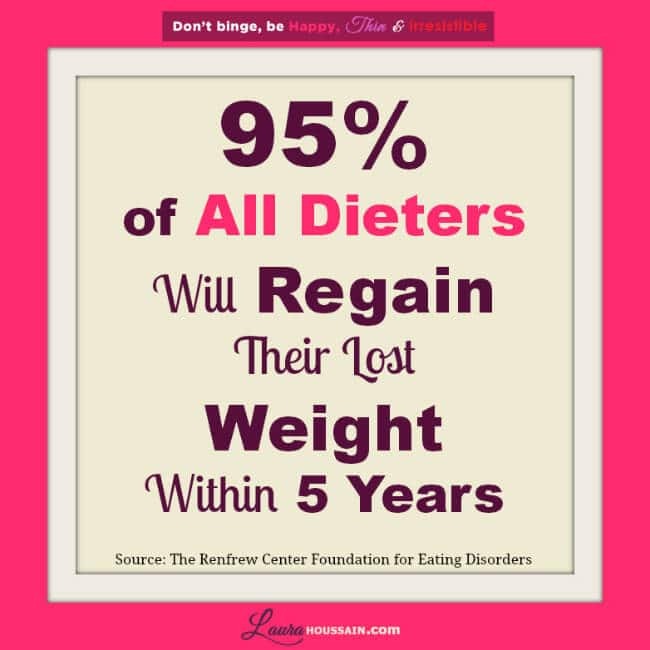 This figure is an underestimation, as it doesn’t include all forms of eating disorders. Binge eaters and many emotional eaters experience guilt after a binge, but bingeing while on a diet is inevitable. I know that I have experienced cravings within 48 hours of starting a diet each and every time. That is normal with any form of calorie restriction. What is not normal is that food experts and weight loss gurus continue to insist that it’s not. I can still remember a fitness instructor telling me: “I ate perfectly for two years but now I just can’t help myself binge from time to time. I know exactly what I should be doing. I teach it to others really well, but I just can’t seem to be doing it any more.” I think having a “perfect diet” for two years must build up humongous levels of frustrations. My point is that diet slip ups are normal. Chronic dieting is more than likely to cause binge eating. Recognizing that diets are a worldwide massive failure, considering the ever increasing average weight of the population, will help you overcome your diet guilt. I know that fast food and convenience foods are also responsible, but the massive media exposure given to dieting must have some measurable impact on the weight of the population. It may take me a whole book to convince you that it’s really not you who should feel guilty but the people who have told you that your problems will be over with the right restrictive diet. this artical made me feel worse. I’m not sure why. “Bad” feelings are opportunities to observe your belief system and thought process so this may actually be a chance for you to do so. My purpose is not to make you feel good but to make you grow and empower yourself so that you become at peace with food and that feels really good. But self-growth does include experiencing some emotional discomfort. I hope that’s OK for you. Thank you for an excellent article – really good advice.After 6 months of strict, severe dieting, I lost 15 kilos and while I didn’t feel healthier for it, I was happy with the way I looked.It only took a casual comment from my Mother ( ” Yes, well, you could stand to lose more off your hips. ” ) to send me plunging straight back into a bulimic, binge-eating nightmare.I’ve now regained all that weight I lost plus more.Wish I’d read your advice before this ! Thank you for your comment! It’s so hard when your parents tell you that your efforts are not enough. I had perfectionist parents and whatever I did I never felt like it was enough. I really know how it feels to try your best and get scolded. The only way I have found to break free is to let go of wanting my parents approval and seeing them as human beings with fears and feelings of inadequacy. I also made sure to become my number one supporter and give myself my full unconditional approval. I’m glad that my article has helped you and that you’ll try the non-diet way to weight-loss. It may be a bit scary at first but it so much more peaceful that trying rigid rules that keep you binging and make you feel awful about yourself. Thank you Navi. I’m glad you like it.